The Eurozone Crisis Challenge to Democracy: Which Way Forward? Does the euro crisis ring the death knell for European citizens’ influence in the EU decision-making process? During the eurozone crisis, decision-making has become more and more remote from the citizens, as EU member-state leaders in the Council have taken most of the initiatives. This has altered the EU’s ‘democratic’ settlement (which expects a relative balance among major EU institutional actors), by sidelining the European Parliament (EP) and turning the EU Commission into little more than a secretariat tasked with technocratic oversight of automatic rules coming from more and more stringent pacts for fiscal consolidation. Moreover, national parliaments have had little role other than to rubber stamp intergovernmental treaties at the risk, if they failed to do so, either of sanctions from the markets or, for countries under IMF or eurozone loan bailout strictures, a loss of access to further financing. European leaders engaged in intergovernmental decision-making, whether in the European Council, in the Council of Ministers, in Summits, or in negotiating Treaties, often tout themselves as most legitimate because they indirectly represent their citizens. What they fail to recognize is that however crucial intergovernmentalism may appear in the heat of the crisis, it is actually the least democratic of processes because it gives those leaders with the greatest bargaining power an undemocratic advantage in the closed door negotiating sessions of the Council. 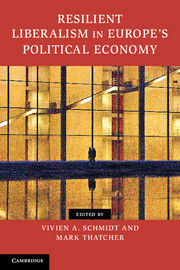 That ‘ordo-liberal’ (neo-liberalism with rules) austerity policies focused on a ‘Culture of Stability’ dominate the eurozone, and remain predominant even as eurozone countries have slid into recession and worse, is testimony in no small measure to the power of one country in the intergovernmental decision-making process. Such increasing intergovernmentalism, added to the hesitant EU leadership that has failed to solve the crisis, only further fuels citizens’ disaffection from the EU as well as disillusionment with their leaders. Citizens find themselves increasingly unable to influence decision-making, whether as voters who express their dissatisfaction by throwing their governments out of office with increasing frequency – only to find the subsequent government implementing the same policies – or as protesters in the streets. Is there any wonder, therefore, that we see the rise of extremist parties on the right and the left, ready to jettison the euro and, possibly, the EU? The legitimacy crisis, then, is not a problem just for the EU but also for national polities. At the national level, we increasingly find ‘politics without policy’ in domains of EU competence, as more and more policy decisions have moved to the EU level while leaving the political debates of the left and right to the national arena. At the same time, the EU level appears to be ‘policy without politics,’ as member-state leaders in the Council eschew the language of the left or the right when speaking of their national interests, the EU Commission uses the language of technocracy, and the EP, if not left out of the game entirely, uses the language of the public interest . But while the language may be apolitical, the policies in response to the crisis are in fact highly political – and largely conservative and ordo-liberal. But they have not been subject to the kind of political debate at the EU level that citizens would normally expect, and which at the national level traditionally serves to legitimize policy. The question therefore is: should one politicize EU institutions in order to legitimize its policies? If the answer is yes – how? Through an elected European President – of the Council or the Commission? By shifting the balance toward the European Parliament? By allowing more discretion to the Commission? Moreover, without any thought to the powers the Council President would exercise, having the legitimacy of popular election would either remain largely symbolic, leaving that person too little power if nothing were altered in the job description, or it might radically alter the EU institutional balance by appearing to confer too much power to that person, to the detriment of member-state leaders in the Council and possibly the EP. By contrast, the election of the Commission President via European Parliamentary elections – the preference of major EP party groupings for the EP 2014 elections – might work to the advantage of all institutions. In the scenario envisaged, each main European party grouping would name its candidate for Commission President, set out a party platform, and then campaign in member state after member state, debating with the candidates from other European parties about their visions for how to solve the crisis. This could be enhanced were national parties to name potential Commission candidates to head their party lists, thereby enabling national electorates to put a national face on the EU campaign, and get the chance to elect their Commissioner. It would have the added value of encouraging top national politicians to run for the EP, and then to serve as Commissioners. This alternative would help rebalance the EU system by giving the Parliament along with the Commission President greater representative legitimacy, at the same time that it would make the Commission more accountable to the EP as well as better able to legitimately exercise administrative discretion when implementing Council policies, by orienting them to the political preferences of the EP majority. But most importantly, the elections themselves would help bring real (left/right) political debate back into the EU policymaking process, in principle spurring citizen interest and serving to legitimize policy. One caveat, though, in the line of ‘be careful what you wish for.’ The EP elections of the Commission President could themselves become a losing gamble were they to remain what they have long been, second-order affairs of little interest to citizens, and if the different parties in the elections fail to come up with clearer visions and better narratives to legitimize ‘more Europe’ to the citizens. The gamble would be lost entirely, however, were the only interest to come from the political extremes, leaving the EP with a thinning centre hemmed in by extremists of the right and left. Under these circumstances, such elections would politicize only to delegitimize the Commission and the EP. To ensure against this eventuality, along with increasing national political volatility, best solve the eurozone crisis before 2014. Vivien A. Schmidt is Jean Monnet Professor of European Integration and Director of the Center for the Study of Europe at Boston University. She is the author of Democracy in Europe: The EU and National Polities [Oxford 2006]. Posted on December 15, 2012 January 19, 2013 Author eamrienCategories ArticlesLeave a comment on The Eurozone Crisis Challenge to Democracy: Which Way Forward?